Two satellites for China's Beidou navigation system launched aboard a Long March 3B rocket Sunday, further expanding the space-based positioning network as China eyes global service by 2020. Liftoff of the Long March 3B rocket was at 4:50 a.m. Beijing time on Monday. The Beidou constellation, also known as Compass, is China's counterpart to the U.S. Air Force's Global Positioning System, which provides navigation services to military vehicles, precision munitions, civil aviation, personal cars, boats, and search-and-rescue forces. Sunday's launch marked the first time China orbited two Beidou satellites on the same rocket. Chinese industry developed a dual-payload adapter to launch the satellites one on top of the other inside the Long March nose fairing. The Long March 3B launcher lifted off from the Xichang space center at 2050 GMT (4:50 p.m. EDT) Sunday, state media reported, and tilted southeast to reach an oval-shaped transfer orbit inclined 55 degrees to the equator. The 18-story liquid-fueled rocket reached an orbit ranging from 150 miles to more than 13,000 miles above Earth. Each satellite will use its on-board propulsion system to circularize its orbit at an altitude of about 21,500 kilometers, or 13,359 miles. It was the first time China launched a dual-satellite primary payload into a high-altitude orbit, according to the China Academy of Launch Vehicle Technology, the state-owned contractor for the Long March rocket family. Now in operational testing for users across China, the Beidou system will provide global coverage with a constellation of 35 satellites by 2020, according to Chinese officials. China activated the Beidou network in December on a trial basis. Its 11 operational satellites currently provide services over the Asia-Pacific region, including most of China. The coverage zone stretches from the southern border of Russia to Australia, and from India in the west to the Pacific Ocean in the east. 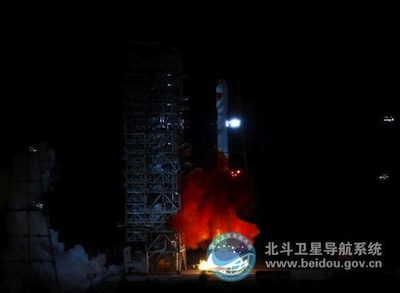 More Beidou launches are planned later in 2012. Sunday's flight was the fifth Chinese space launch of the year.